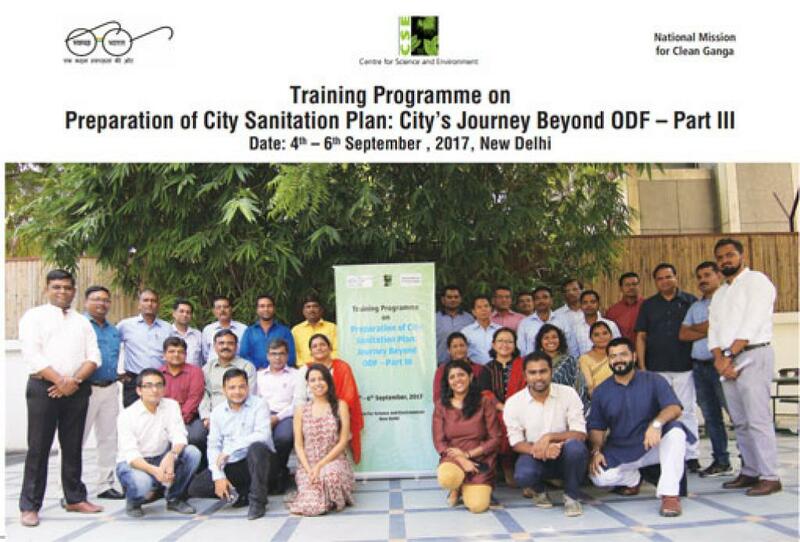 Following the successful completion of the First and Second Handholding Training Programmes, CSE organized the third handholding training programme on Preparation of City Sanitation Plan- City’s Journey Beyond ODF– Part III from 4-6 September 2017.The training is part of a five stage handholding process for the preparation of CSPs for select Ganga basin cities. 19 Participants from eight cities of Ganga basin states- Uttar Pradesh and Bihar (Ramnagar, Gangaghat, Chunar, Bijnor, Buxar, , Bodhgaya, Muzzafarpur and Katihar) attended the three day training. Participants included state officials concerned with SBM, Atal Mission for Rejuvenation and Urban Transformation (AMRUT), commissioners, executive officers of select target cities and officials from PSI (Patna, Bihar) and RCUES (Lucknow, Uttar Pradesh). Speaking on the occasion, Dr Suresh Rohilla (Programme Director, CSE) stressed on urgency of effective sludge management in Ganga basin towns. He further asserted that without addressing FSSM, the objective of national flagship programmes such as SBM and Namami Gange will not be achieved. In India, only 38 % of towns are connected with sewer and the rate of sewer coverage is very slow. Hence, there is an immediate need to utilize the options of DWWTS and FSTP to address the issue of river pollution. Aim: To enable cities / towns to develop city owned CSPs focusing on effective and implementable faecal waste management to restrain pollution load in the Ganga Basin. 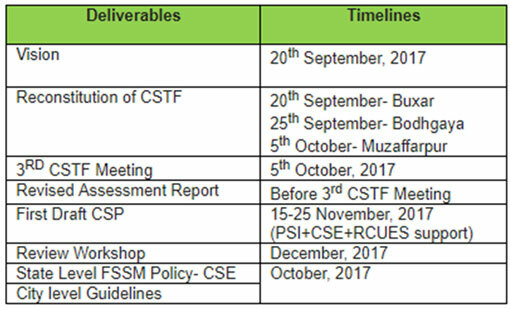 To review CSTF formation /meetings and assess compiled status assessment reports of cities. To develop strategies of each technical sector (water supply, sewerage/ septage, storm water, solid waste and access to toilets) including governance and municipal finance) from identified issues. To identify, formulate, and prioritize key issues and vision of the for an effective action plan. "The ULBs that are preparing city sanitation plan through these trainings are enhancing their knowledge and becoming capable of preparing their CSP themselves." "The training was immensely helpful to all the participants and they learned the best practices on FSSM, storm water and rain water harvesting, the sessions were very informative and it indeed provides opportunies for Bihar to implement pilot project on DWWTS and FSTP"
"We learnt about FSTP, DWWTS, SWM, Rain Water Harvesting and it has helped us to develop a holistic view for developing a time-bound plan for our NPP and help make a beautiful and healthy city, with improved ranking". "We committed for pilots projects on Faecal Sludge Treatment Plant and Decentralized Wastewaster Treatment System for Bijnor."